Hyderabad, Aug 8 (PTI) P V Sindhu believes Indian shuttlers haven't got enough time to prepare for the Asian Games but expects the team to deliver more than just the one bronze medal claimed in the 2014 edition. Indian women's team had won a bronze medal at Incheon four years ago and Sindhu hoped they can change the colour of the medal this time when the multi-sport event gets underway on August 18. "Definitely, it is going to be very different because we have the team events and also the individuals. Very less time to prepare. But, as a team, last time we got bronze. This time, we would expect a better one," said Sindhu, who clinched her second silver at the World Championships last Sunday. "Also, individuals, I hope that I do well. Taking the World Championship silver, taking it as a confidence, I hope that I move forward and do well." India haven't won a medal in women's singles at the Asian Games. Eight-time former national champion Syed Modi is the only individual medallist for India at the Asiad, having won a bronze at the 1982 New Delhi edition. Sindhu defeated top Asian players such as Japanese duo of Nozomi Okuhara and Akane Yamaguchi and Korea's Sung Ji Hyun en route to her second successive final at the World Championship. Given her impressive form, chief national coach Pullela Gopichand is hopeful of another successful outing at the Asian Games. "I think to beat Okuhara in the quarter-finals and Yamaguchi in the semi-finals is something very good. Beating both of them, the way she (Sindhu) did, I think it has been fantastic. We are hopeful for another successful event at the Asian Games in the coming 10 days," he said yesterday. "I am really very happy for the silver. It's been a good week. As you all know the draw was comparatively tough. From the first round, there were good tough matches. It's good that from my side, I gave my 100 percent. Definitely, I will have to try more harder and harder until I get that gold. I hope, one day, I will get that." 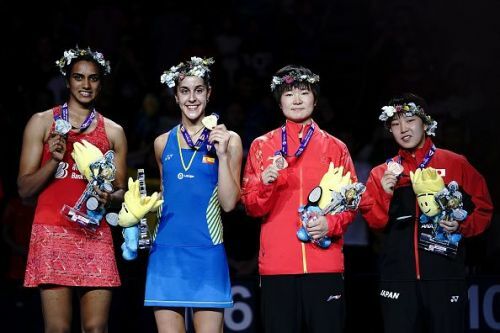 Sindhu finished second after losing to Olympic champion Carolina Marin in the title clash. It was her second defeat in the summit clash as she had lost an epic final against Okuhara at Glasgow last year. Asked about the performances of other players in the World Championship, Gopichand said: "I think we had four quarter-finalists at the world championships more than it has ever been. But, I think there were areas which could have improved definitely. (Kidambi) Srikanth and (HS) Prannoy could have done better," he said. "The conditions were a little tricky at the World Championship as some days were slow and some days were fast and it was a learning experience for the players. "We had the Commonwealth this year, we did well. We had the World Championships relatively good. Hopefully, at the Asian Games, if we do well, this year will be a successful year for Indian badminton," he signed off. Saina vs Sindhu: Who has better head-to-head record against top 10 players?